Fizzies have come out with two new flavors just in time for Fall. Hot cocoa fizzies are one of the flavors that just came in and I have to admit I was a hesitant on whether or not I would like them. I was pleasantly surprise at how great they taste. Amerilab Technologies Inc. which purchased the trademark in 2006. They are known as the Alka Seltzer candy, as you drop the drink tablet in water and watch it fizz just like an Alka Seltzer. They are a healthy alternative to soda's as they have 100% RDA of Vitamin C , low in calories and are sugar free. Normally fizzies are dropped in to a glass of cold water, however with the hot cocoa fizzies you place them in hot milk. Before you know it you have a delicious cup of creamy hot chocolate. It's pretty amazing that just one little candy tablet can make such a great drink. I love hot chocolate and it seems that is my favorite winter time drink. As the weather continues to cool off I am sure I will be drinking more cocoa then usual. I think the next time I have some I am going to try adding two tablets, however that might be overkill, but I have to give it a try. 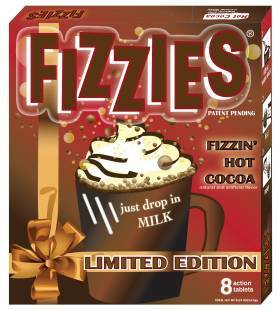 These hot cocoa fizzies will be available for a limited time only. Each box has 8 individually wrapped tablets and retails for $2.99. Hurry and get yours today. If you were a kid growing up in the 60's and 70's and have enjoyed fizzies as part of your childhood share your stores with us and our readers. We would all love to hear your experience with these yummy drink tablets.